John Andre was born on December 11, 1918, in Colbert County, Alabama. He was attending the ROTC program at the University of Alabama when he dropped out to enlist in the U.S. Marine Corps on August 5, 1940. After completing aircraft mechanic school, he served with VMF-1 at MCAS Quantico, Virginia, from May 1941 to March 1942. Andre then entered flight training in March 1942 and was designated an Enlisted Naval Aviator on November 16, 1943. He then attended Night Fighter Training before serving with VMF(N)-541 at MCAS Cherry Point, North Carolina and then in the Philippines from April 1944 to July 1945, where he was credited with the destruction of 4 enemy aircraft in aerial combat while flying the F6F-5N Hellcat night fighter. Andre left active duty on August 15, 1946, and joined the Marine Corps Reserve on November 20, 1946, receiving a reserve commission as a 2d Lt on May 7, 1947. He returned to active duty on October 27, 1950, and was assigned to VMF(N)-533 at MCAS Cherry Point from October 1950 to October 1951, and then deployed to Korea with VMF(N)-513 from November 1951 to June 1952. During this time, Lt Andre was credited with destroying 1 more enemy aircraft in aerial combat, making him an ace. After returning to the U.S., he served with VMA-331 at MCAS Opa Loca, Florida, from August 1952 to October 1953, and then served as a flight instructor at NAS Corpus Christi, Texas, from October 1953 to June 1956. He served as a Provost Marshall with the Fleet Marine Force from September 1956 to November 1957, followed by service with VMF(AW)-542 at MCAS El Toro, California, from January 1958 to June 1959. Maj Andre became a Warrant Officer (CWO1) on July 1, 1959, and served with the Fleet Marine Force from August 1960 to April 1961. He served at MCAS El Toro from April 1961 to November 1962, followed by service at MCAF Santa Ana, California, until November 1964. 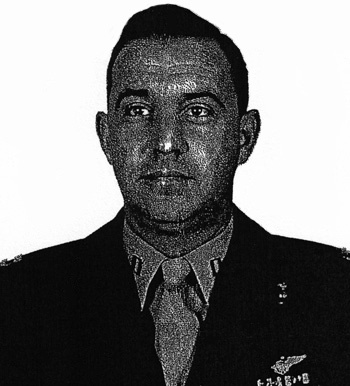 His final assignment was back at MCAS El Toro from November 1964 until his retirement from the Marine Corps on August 31, 1966, retiring at his highest rank held of Major. John Andre died on July 7, 1983, and was buried at the Calvary Cemetery in Lawrenceburg, Tennessee. For heroism and extraordinary achievement in aerial flight as Pilot of a Plane in Marine All Weather Fighter Squadron FIVE HUNDRED THIRTEEN during operations against enemy aggressor forces in Korea on 7 June 1952. While conducting a night intruder mission over enemy main supply routes, First Lieutenant Andre detected an enemy motor convoy proceeding through mountainous terrain and initiated a series of bombing and strafing attacks beneath flare illumination. Suddenly attacked from the rear by an enemy night interceptor during his ninth low-level assault, he successfully evaded the hostile fire and, regaining altitude, skillfully maneuvered through the darkness to a position behind his assailant where he opened fire with his own machine guns and sent the enemy aircraft plunging to the earth in flames. By his outstanding airmanship, initiative and steadfast devotion to duty, First Lieutenant Andre was directly responsible for the destruction of a hostile aircraft and several enemy supply trucks, thereby upholding the highest traditions of the United States Naval Service.